Sweat Your Prayers™ is a 5Rhythms practice with minimal instruction. 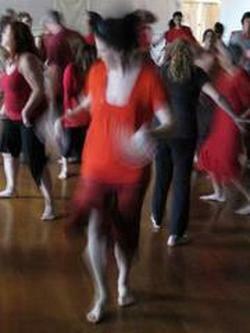 The teacher will play music that encourages you to move and dance in each rhythm. Just follow how your body wants to move - there are no steps to learn. The rhythms themselves are gateways to literally thousands of different movement landscapes. Like the body, they are alive and designed to catalyze the dancer’s unique movement expression in the moment. You are different every time you walk into the room, so is the group and so is your teacher. Therefore, each class holds completely varied possibilities.